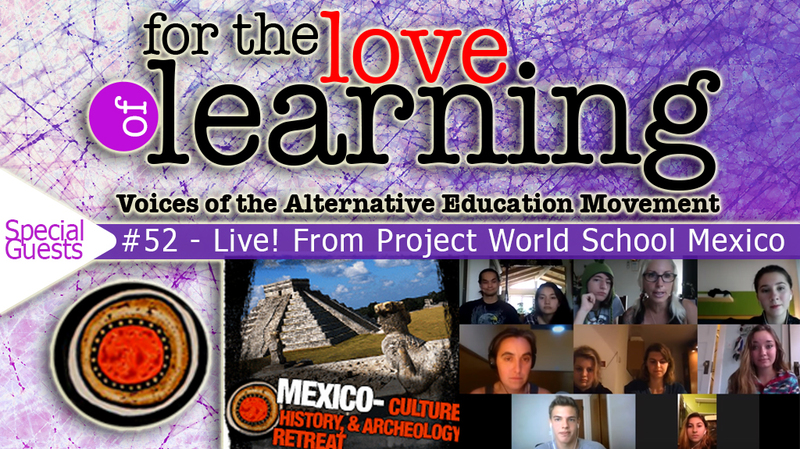 This week we have the special opportunity to speak with a group of 12 participants of the Project World School Teen Temporary Learning Community live, in Mexico! The group has flown in from across the planet to share an immersive learning experiences only possible in this singular point on the planet and in this particular time to form an intentional temporary learning community. The group of teens will share their experiences during the first two weeks of the “retreat” and explain what social, immersive and experiential learning looks and feels like. Project World School, co-creates temporary learning communities around the world so that teens and families can gain a group educational experience. Project World School was founded by mother and son Lainie Liberti and Miro Siegel, who have traveled the world for over five years. Considering themselves to be “accidental unschoolers”, both have learned tremendously from their worldschooling experiences. Through their journeys, they were inspired to collaborate with other worldschoolers. From this desire, Project World School was born. 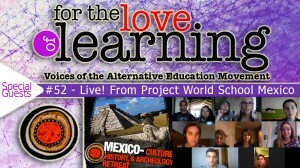 Project World School organizes retreats around the world. PWS will host community learning events in areas such as Ecuador, Peru, Mexico, US and Thailand over the next year and a half. Participants will enjoy topics such as surfing, marine biology, conservation in the Amazon jungle, archeology and history in Cusco & the Sacred Valley, and more.